These are paradoxical times on our planet. Times of great suffering, and times of great promise. More than ever, our survival as a species depends on our ability to honor and respect our differences while acknowledging and embracing our interconnectedness. My intention in bringing forth these 64 faces is to reclaim, reflect and celebrate the soul of the world – a miraculous multiplicity of ONE. It is my way of illuminating the incredible uniqueness of the individual person or tribe, as well as engaging in a deep, intimate experience that transcends ‘self’ and ‘other’. These faces embody the very kind of peace, love and understanding that I long to see in the world and experience in myself. 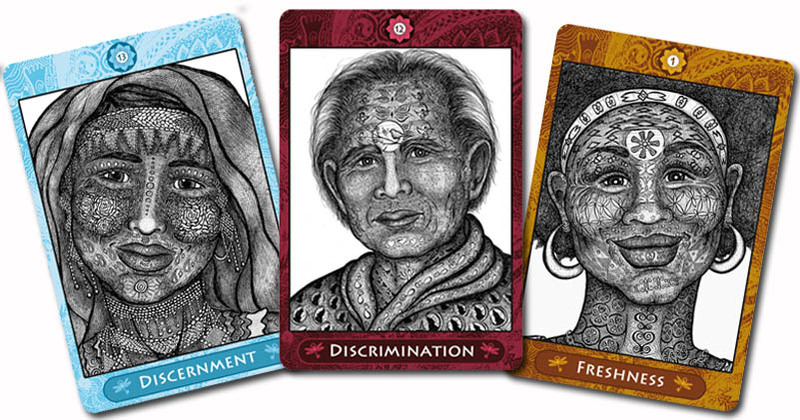 They represent both ancient and new human archetypes that connect us with our collective evolution. Since many of the Wisdom Keepers are elders, one of my deepest intentions for this project is to honor and celebrate the wisdom and radiance of a population that in our youth-obsessed culture all too often go unseen, under-appreciated and under-utilized. Often called the "organ of emotion," the human face is a dynamic canvas and one of our most powerful channels of nonverbal communication. From the moment we’re born, we are constantly monitoring, mirroring and reading the faces around us, looking for cues, so that we can better understand what others are feeling and assess whether we are loved and safe in the world. The human capacity to form healthy attachments is deeply determined by the quality of presence in the faces of our early caregivers. Studies have shown that when babies are met with empathic faces, they relax and thrive; when they are met with neutral to ‘negative’ expressions, they often become emotionally disorganized and struggle to form healthy bonds as they grow. That said, we humans are immensely resilient. We have the potential to heal old wounds through the formation of new loving attachments. Just looking into a face that reflects love and acceptance has a lasting impact on how we see and experience ourselves, as well as on our ability to give and receive love. The human face also transmits deeper states of consciousness. When we spend a long enough time looking into the eyes of a truly present being, we begin to access our own inner radiance and aliveness. 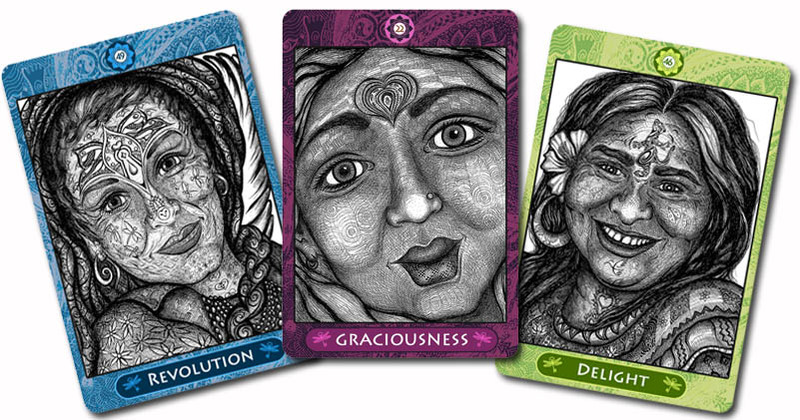 The faces of the Wisdom Keepers have come specifically to recognize your potential, reflect your beauty and receive your love. Connect with each face as you would a friend, a grandmother, a mentor, a lover or a guide. Relax into the gleam in the eye. Allow yourself over time, to develop a sincere relationship with each of the Wisdom Keepers -- you will be surprised at the power of their medicine. Though each face is different, they all come to love you unconditionally, to reveal important truths about who you are, and to help you remember the dreams that have been seeded in your soul. 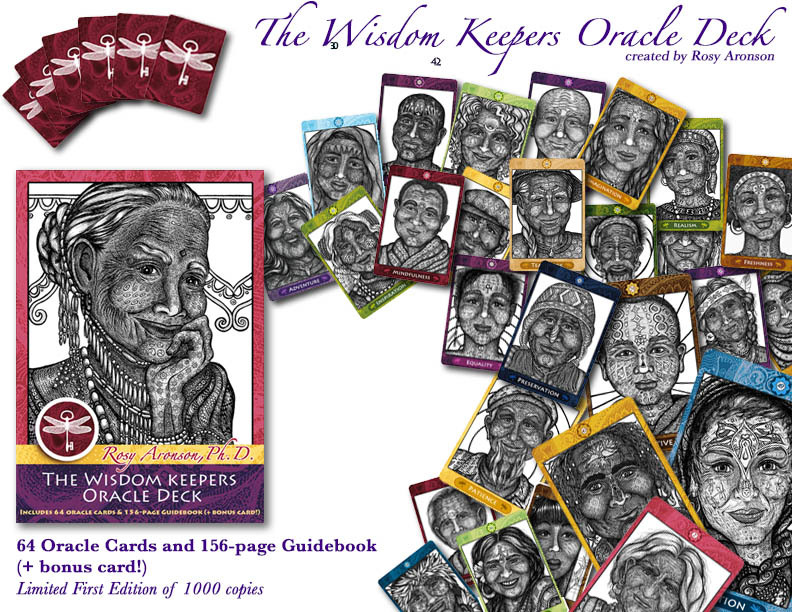 The creative process behind the birth of the Wisdom Keepers has been mysterious, whimsical and deeply intuitive. While this process is deeply embedded in my interest in spirituality, service, Human Design and the Gene Keys, the particular faces I’ve drawn have arisen in unique ways. Often they’ve emerged through my dreams and imagination. Every once in a while I've felt a strong pull to capture the energy or expression of an actual person -- or a hybrid of people -- who have inspired or moved me. There have been times when others have shared their visions of a face with me, and I've integrated those visions into an image. When drawing, I consciously enter into an intimate, meditative and intuitive space. I allow myself to drop in to a highly rhythmic, detailed process -- dot by dot, line by line. The process of creating these faces has been exceedingly soothing to me. It has not only allowed me to work through my own grief about the wounded and conflictual state of the world, but to apply and receive my own form of medicine. Ultimately, I see these drawings as soul windows, or medicinal mirrors. Each being is an exquisitely unique reflection of the truth that the face of Love & Compassion is universal and of the potential that resides deeply within each of us. 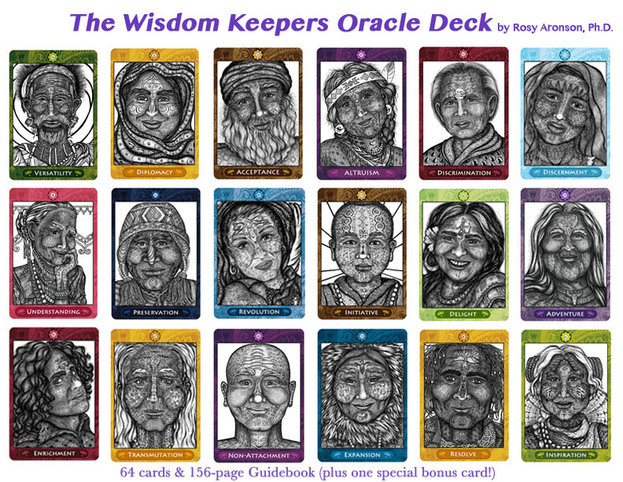 Just as I had little control over who came through when I was bringing the Wisdom Keepers into form, I had little control over what they had to say when it came time to creating the Oracle Deck. Writing the 156-paged Wisdom Keepers Inner Guidebook has been a deeply intuitive process that has required complete surrender and trust. 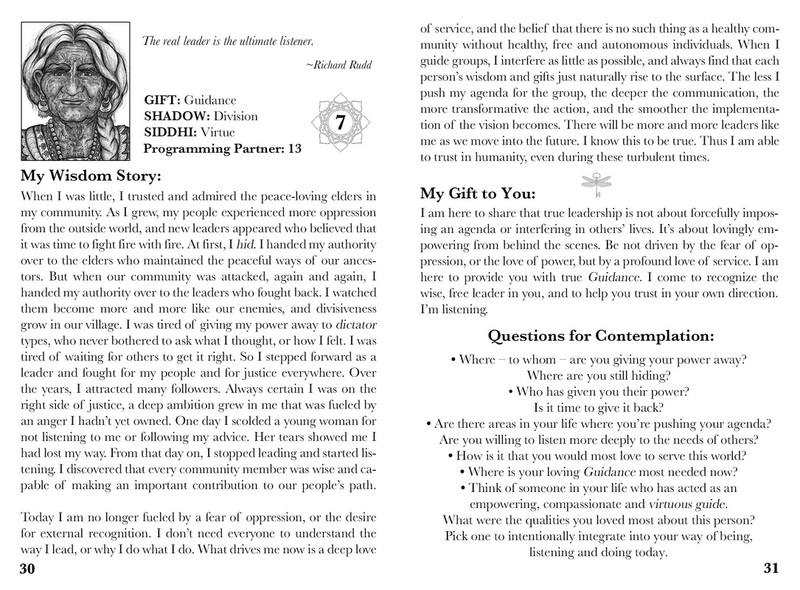 As I allowed the Wisdom Keepers to reveal their personal stories to me, the most important thing I learned was that each one of them discovered their Gifts by not only surviving painful and challenging experiences, but by embracing them. I learned that these wise and radiant beings aren’t that much different from you and me. They are deeply human. How comforting it is to remember that very few of us get to be present, loving and compassionate in this life without experiencing some kind of pain, loneliness, discomfort and fear! So wherever you find yourself at this moment, if you’re learning to greet your challenges with openness and curiosity, you’re likely on your way to becoming your own keeper of wisdom. 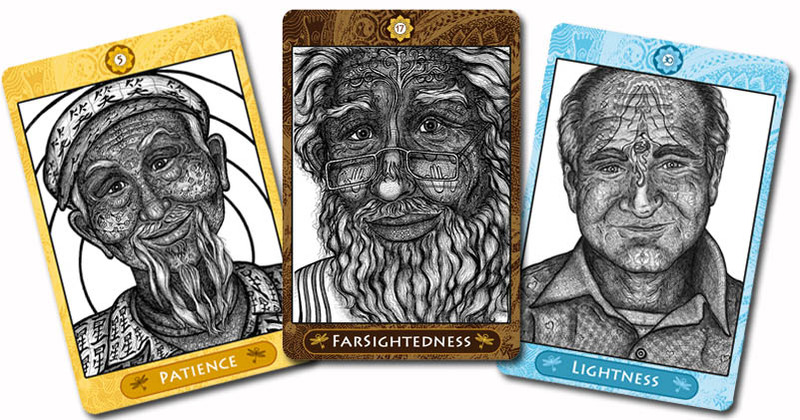 Please note: While certain Wisdom Keepers may happen to resemble individuals you know, their faces and stories have been channeled as a way of reflecting archetypal themes and are not related to specific people. the ultimate reality shining forth from living mirrors. The seeker need only cast their gaze upon this holy countenance. Together, Face to Face with the mystery. Copyright © 2014, Roselyn Ann Aronson. All rights reserved.